Smart Tab SX Series for boats 15′ to 19′, 60 hp to 140 hp, available in black or white. 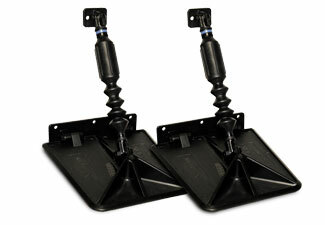 Smart Tabs SX Series for boats 15′ to 19′, 60 hp to 100 hp (4 Stroke) , available in black. As an extension of the boats running surface, Smart Tabs change the performance and handling characteristics by automatically adjusting to water pressure, boat speed and payload. At slow speeds, they deploy downward to increase stern lift keeping the boat level, allowing the boat to plane easier and faster. At cruising speeds, they are pushed to a horizontal position (retracted), but remain under a load creating ride control like shock absorbers. The automatically comes down as the bow starts to rise during acceleration.